Bill Gates has never taken himself as seriously as he does his company. So it was only fitting that it was with a humorous and star-studded video parody that he kicked off his final pre-show keynote at the Consumer Electronics Show (CES) Sunday night in Las Vegas. Gates fictionally portrayed his last day of full-time work at CES in a video that had everyone from presidential candidates Hillary Clinton and Barack Obama to The Daily Show host Jon Stewart turning him down for a job, and music mogul Jay-Z and film actor Matthew McConaughey patiently enduring his painful attempts at new extracurricular activities—rapping and hitting the gym. When the laughs and well-received applause from a crowd of several thousand at The Venetian hotel and casino died down, Gates once again outlined his vision for a world of service-connected devices that allow for human interactions through speech and touch—a vision he’s been promoting for years from the CES stage. He added that eventually, devices also will know the context and location of the people using them, so location-based information from a device will be automatic. Gates’ vision for a connected world of devices and services has always been impressive. But as he makes his full-time exit from Microsoft, the company has yet to bring it to the mainstream user. Although some of the news in Gates’ keynote seems to suggest Microsoft is poised to change that, the company’s strategy remains rooted in disparate product lines that haven’t quite come together. And the company is facing increased pressure from competitors such as Apple and Google, which have turned ideas Microsoft has bandied about for years—such as touch-screen technology and Web-based services—into profits the software giant has not come close to achieving with its own efforts. 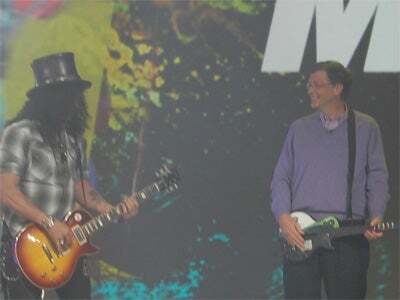 Still, Microsoft introduced some new deals and services on stage Sunday that show the company is on the right track. In particular, Microsoft has struck some savvy deals with entertainment companies MGM and ABC to bring films and popular TV shows, respectively, to Xbox Live. That service and community, aimed at gamers using the Xbox console, has turned the Xbox into a viable television platform, tying together Microsoft’s gaming strategy with its aim to provide premium entertainment. Along those lines, the company also announced a deal Sunday with British Telecom to deliver its IPTV service Mediaroom through the Xbox console. Other offerings that tie together multiple services and devices on display Sunday also showed that Gates’ connected services vision is coming into focus. A demo during the keynote showed how users can take photos from within a Windows Live-hosted service and post them seamlessly to a blog or e-mail them to friends. Another showed how users can purchase movie tickets on a Windows Mobile device using voice commands and then text-message those tickets to other mobile devices. Microsoft also showed some progress on the Zune media player front, even though many still view the device as a poor competitor to Apple’s enormously popular line of iPods. During the keynote Microsoft introduced Zune Social, an online community where Zune users can share playlists, track what their friends are listening to on their own devices and connect automatically to the Zune Marketplace to purchase songs. Toward the end of Gates’ keynote, he and Microsoft President Robbie Bach demonstrated a prototype device from Microsoft Research that seemed to represent the culmination of the company’s connected-device strategy. The device used visual recognition to identify people and places in its line of “sight,” and remind a user of events related to them. For example, when Gates aimed the device at Bach, the device identified him and reminded Gates that Bach owed him $20. However, information neither Gates nor Bach could provide was how long it would take for such a device to be fully developed and released. When all was said and done on Sunday, Gates ended his CES legacy not with a bang but a whimper, allowing a special guest star to steal what would have been his final CES thunder. During what was poised to be a $20 contest between Gates and Bach on the popular Guitar Hero game, Gates instead introduced a ringer to take his place—former Guns N’ Roses guitarist Slash. As the shaggy-haired guitarist played a loud riff from the band’s song “Welcome to the Jungle,” Gates stood smiling on the stage and let Bach say the final goodbye, assuring attendees that he, at least, would be back again next year.